Word to the wise from a FOAF was of a new eatery on the outskirts of Woodbridge. Andy's Googling revealed precious little, but he'd been directed towards a particular turn-off from the A1152. There we headed on a cold, cold day. Into the Valley Farm Road we rode, then a tentative right and park up. Horse business abounds, equine laundry, and no obvious sign of ... a-ha, here we are, The Cook's Shed. Not inclinded to sit outside with those slushpiles on the tables. Inside, and wow. Log-burner, long wooden tables and aromas of good food. By no means the only ones in here, we take a pew among the chutney books and decrypt the chalked-up specials. One lady -- somewhere between Helena Bonham Carter and Rome's Cleopatra -- does the lot: cooks, takes orders, tidies plates, etc. She brings us our drinks, has a chat with some customers, then goes back to the fully open kitchen to prepare our orders. Room resembles a giant I-Spy game with knick-knacks and misc items everywhere. Here's my Cook's Shed breakfast -- inc. saute pots and fried egg -- c/w Heinz organic ketchup. Most welcome, warming the cockles. Andy's more adventurous with his chorizo & chestnut soup: v. good. Grabbing a quick chat with the owner, she says that she's only open to the general public twice a week at present. We're lucky today. 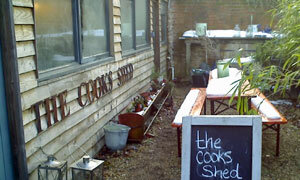 Mostly she does workshops / event catering / private dining / children's parties / business dining and supper clubs. That's how her business card reads. Reputation spreads the best way by word of mouth. We're both reminded of our trip to the (now defunct) Butley Barn. Sure enough, Shed lady has connections that way. Coffee is calling, to be accompanied by shared beetroot brownie and pear cake. That nice lady comes over, again, bringing us a large cafetiere for two. Like the large overhead clock, I'd have been more than happy to be stuck in there. If it was a car -- Volvo XC60. If they were passing by -- Lyndsey Marshal.